Drain & slice pickles, put back into jar, add sugar, garlic, salt & peppers. Make sure lid is tight, shake back and forth. 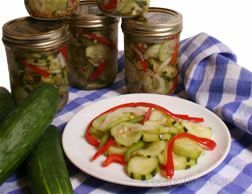 Everyday turn pickles - upside down or up right to marinate. They make their own juice. Does not have to be stored in refrigerator unless you like them cold.